Get your very own Skirts Plus kit today for only $32.00 plus a government-required 10% federal excise tax and $11.30 for shipping and handling. Now you can have the skirt you want, exactly how you want to make it, just like Guido and Dion. 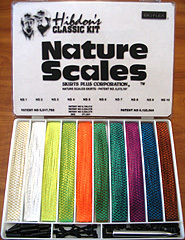 The "Hibdon's Classic Kits" are available in "Nature Scales"®, as well as "Nature's Edge"® and "Sil-A-Chrome"®. Each kit comes with ten units of each color listed below, 50 bands, 6 rattle straps, 12 rattles, and our own banding tool with easy to follow instructions. 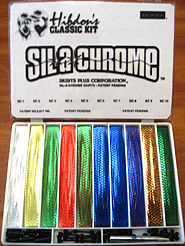 Includes a variety of colors for both jigs and spinnerbaits. We’ve put the glitter on the outside, in a scale pattern for maximum brilliance... unbelievable in the water. The texture feels like real fish scales and you’ll appreciate the durability. Included colors: white with gold glitter, white with silver glitter, chartreuse with gold glitter, lime with gold glitter, orange with orange glitter, pumpkin with green glitter, purple with green glitter, purple with fuchsia glitter, black with blue glitter and brown with orange glitter. 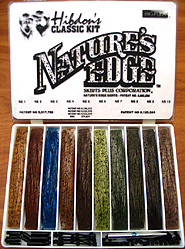 Ideal for jig fishermen looking for earth tones. Unlike any skirt material you’ve ever seen. Completely natural tones with bursting spots of black, yet the translucent strands capture sun light creating texture and depth. Perfect for adding extra flash to your skirts. The ultimate shine of chrome, in a fish scale pattern, on silicone rubber was first created here after years of research. The mission was to give extreme flash in a skirt that anglers never thought possible. Included colors: white with silver foil, chartreuse with gold foil, lime with green foil, orange with red foil, pumpkin with green foil, black with blue foil, blue with blue foil, purple with blue foil, brown with copper foil, black with green foil. Online payments are processed securely by Paypal. Accepts Visa, MasterCard, American Express, and Discover card payments. Copyright © 2013-2019. Skirts Plus Corporation. All rights reserved.